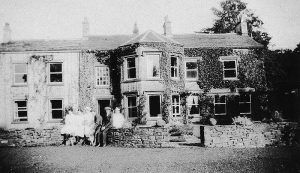 The Rookery is a fine house on Bollington Road, the last on the right going towards Macclesfield. It has been re-furbished and divided into six units in 2004-06. The house was probably built by, and occupied at one time by, the Antrobus family who built several of the early mills in Bollington including Lowerhouse in 1818. In 1832 we believe the house to have been occupied by William Crosley, the engineer and builder of the Macclesfield Canal, then being completed. At that time, 1830s, the house was smaller, extending (see lower picture left) from the right side as far as the gutter down pipe to the left of centre, the extension having been added at a later date. 1851: Peter Brooke a Cotton Merchant aged seventy years had retired to the house, seemingly a widower having two servants to attend him. 1861: Peter Brooke is still living at The Rookery but now with his niece Mary E Antrobus aged thirty five and three servants. 1871: Thomas Antrobus now lived here, he was fifty years old, unmarried and described as a Magistrate and Landowner. He had three servants. 1881: There is no Head of household this year but three `daughters` listed as living at The Rookery Eliza, Alice and Emily Ashworth all unmarried and aged forty, thirty seven and thirty two respectively. However there is also a grandson aged 6 years named Edward Morris with his governess Sophia Crofts aged thirty three years old. They seem to have come from abroad but this information has been scribbled out on the census form but still readable are the words Portugal and British Subject. There were also three servants living with them including a coachman and a visitor from Stalybridge named as George H Benson aged thirty eight, occupation unreadable. 1891: Hercules Campbell Yates was resident at this time. he was thirty nine years old and was a Coroner and Registrar of County Court and originated from Sandbach Cheshire. His wife Mary was thirty six and was born in Stourbridge. They have four sons and one daughter aged between one and seven years. Two Nurse/ Domestic servants from Worcestershire and Lincolnshire plus two further servants. 1901: Hercules and his family are still at The Rookery, they have an extra child now, a daughter Margery aged 8 years. And they have just two servants now. 1911: James Perry aged thirty six years lived at The Rookery with his wife Martha Annie aged thirty eightyears. James was a coachman at this time. They had two children Joseph Birber aged 16 years and his sister Evaline aged 13 years. Joseph was an assistant gardener. 1923 (and 1914) Colin Lings lived here, no further information as this was from the Kelly`s directory. 1939: Francis H Mainprice (1892-1967) aged forty six years was living here. He was a Solicitor. His wife Edith A (Tonge) was also forty six years old. They had two servants at this time. Francis came from quite a well to do family in Altrincham, his father William Samual Mainprice was a Raw Silk Importer who employed several people, as was Francis`s brother Christopher. His other brother William was also a solicitor. So they were a well educated family.